Here’s another of the rock art panels I visited this last Saturday in the San Rafael Swell, known as the Cowboy’s Secret. 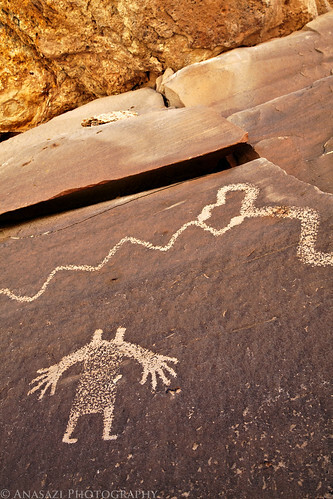 This is an amazing petroglyph panel hidden among many large boulders with a great view of the surrounding area. The main figure kind of reminds me of The Guardian figure painted in Canyon Pintado of Colorado which makes me believe that this could be of Fremont origin. The large snakes carved in the stone above frame this figure nicely.